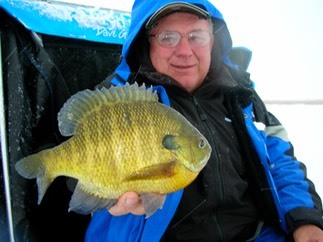 Rarely is a true pioneer fully appreciated in his time.� But Dave Genz, because he so thoroughly changed the way all of us fish through the ice, has been recognized for his vision and accomplishments while still adding to them. To put his impact into perspective:� What did Dave do to revolutionize ice fishing? In the B.G. (Before Genz) Period, many generations of ice anglers struck a frozen pose over one hole in the ice and stayed there whether they caught a fish or not.� Some sought comfort inside permanent shacks. Which took several people (with lots of energy)to move.� But Genz built a better Fish Trap.� Borrowing the concept of a fishing boat and adapting it for use on the ice, he developed the now-famous Fish Trap instant set-up shelter.� Skidding sled, carpeted dry storage, walls that rise with the flip of the wrist.� Because, he wanted mobility, he didn’t rest until he made the right tool for the job. In the B.G. Period, people used the depth finder on their boats all summer, and then fished blindly all winter.� Again the same innovated mind that built us a better Fish Trap brought us the Ice Box (now Vexilar's Genz Pack), an ingenious portable sonar holder that customized depth finders for the use in the same hole we fish out of.� Ice fishing became a whole new ball game. To understand Dave’s impact on the sport, you have to realize he is first and foremost a fisherman, someone who fishes constantly, winter, spring, summer and fall.� From boats as well as through the ice.� He knows what it means to study contour maps, to make a lifetime study of fish habits, to know good equipment when he picks it up the first time or to design it if doesn’t see what he wants.� Dave’s designs have contributed – and in many cases led directly- to the latest generation rods, lures, line, augers, live bait and even clothing. 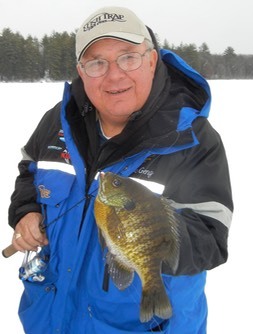 He is the first to stress that many close friends on his Winter Fishing Systems team have contributed support and ideas along the way.� But the clear leader of the movement that modernized ice fishing is Dave Genz. Some of Dave's accomplishments to the sport of ice fishing. Taught us new ways of holding onto ice rods with the pistol grip.